Jersey home. His nickname was “Mack” people, a dedicated team, with a knowl- world leader in motion control, leading and “boring” was one of his thriving son, Heila, VDL Klima, Jets, MMC, edgeable in-house service staff, solid en- to Livingston & Haven’s position as the machine shop’s specialties; grinding Anda, Pro? seal. The diversity of our product lines to- of the commercial marine industry, from highest standards for our customers. We customer focus. Scania diesel, Mitsubi- gether with the continued support and naval architects and operators to ship- are fully committed to our customer’s shi, and Aquadrive distributor ships commitment from our suppliers is key to yards and installers. At every step, Imtra success. Our mission is to provide inno- were acquired. Mack Boring & Parts our mutual success in supplying the best make ssure that the product and support vative productivity solutions to our cus- Company manages approximately 300 modern marine equipment available. tomers. Our team focuses on proactive Authorized Dealers across 26 states. is there to deliver reliable results. 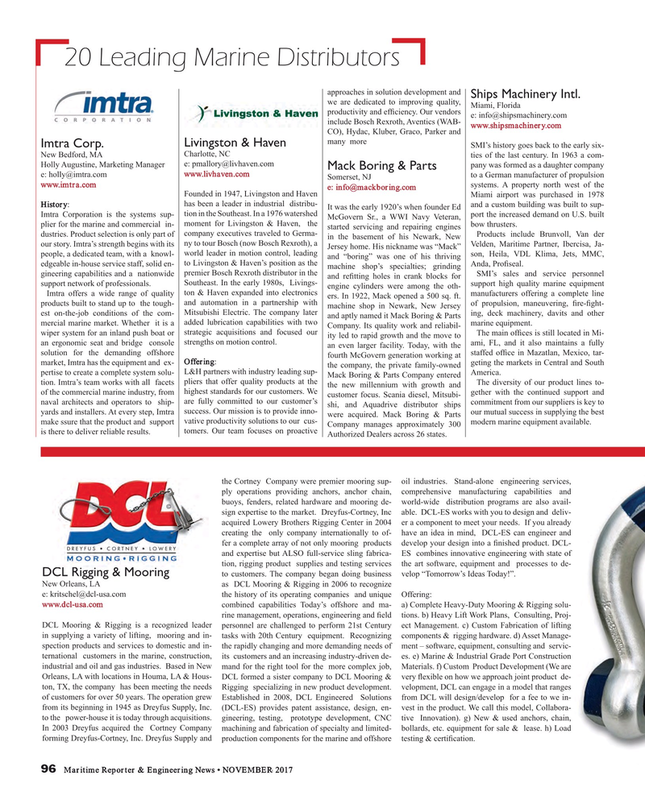 DCL Rigging & Mooring to customers. The company began doing business velop “Tomorrow’s Ideas Today!”. In 2003 Dreyfus acquired the Cortney Company machining and fabrication of specialty and limited- bollards, etc. equipment for sale & lease. h) Load forming Dreyfus-Cortney, Inc. Dreyfus Supply and production components for the marine and offshore testing & certi? cation.